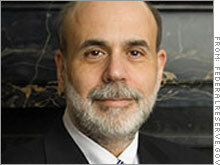 Prepared remarks from Federal Reserve Chairman Ben Bernanke on the state of the economy. NEW YORK (CNNMoney.com) -- Following are Federal Reserve Chairman Ben Bernanke's prepared remarks to the Joint Economic Committee of Congress Wednesday. Economic growth in the United States has slowed in recent quarters, reflecting in part the economy's transition from the rapid rate of expansion experienced over the preceding years to a more sustainable pace of growth. Real gross domestic product (GDP) rose at an annual rate of roughly 2 percent in the second half of 2006 and appears to be expanding at a similar rate early this year. Business spending has also slowed recently. Expenditures on capital equipment declined in the fourth quarter of 2006 and early this year. Much of the weakness in recent months has been in types of capital goods used heavily by the construction and motor vehicle industries, but we have seen some softening in the demand for other types of capital goods as well. Although some of this pullback can be explained by the recent moderation in the growth of output, the magnitude of the slowdown has been somewhat greater than would be expected given the normal evolution of the business cycle. In addition, inventory levels in some industries - again, most notably in industries linked to construction and motor vehicle production - rose over the course of last year, leading some firms to cut production to better align inventories with sales. Recent indicators suggest that the inventory adjustment process may have largely run its course in the motor vehicle sector, but remaining imbalances in some other industries may continue to impose some restraint on industrial production for a time. This forecast is subject to a number of risks. To the downside, the correction in the housing market could turn out to be more severe than we currently expect, perhaps exacerbated by problems in the subprime sector. Moreover, we could yet see greater spillover from the weakness in housing to employment and consumer spending than has occurred thus far. The possibility that the recent weakness in business investment will persist is an additional downside risk. To the upside, consumer spending - which has proved quite resilient despite the housing downturn and increases in energy prices - might continue to grow at a brisk pace, stimulating a more-rapid economic expansion than we currently anticipate. Let me now turn to the inflation situation. Overall consumer price inflation has come down since last year, primarily as a result of the deceleration of consumers' energy costs. The consumer price index (CPI) increased 2.4 percent over the twelve months ending in February, down from 3.6 percent a year earlier. Core inflation slowed modestly in the second half of last year, but recent readings have been somewhat elevated and the level of core inflation remains uncomfortably high. For example, core CPI inflation over the twelve months ending in February was 2.7 percent, up from 2.1 percent a year earlier. Another measure of core inflation that we monitor closely, based on the price index for personal consumption expenditures excluding food and energy, shows a similar pattern. Core inflation, which is a better measure of the underlying inflation trend than overall inflation, seems likely to moderate gradually over time. Despite recent increases in the price of crude oil, energy prices are below last year's peak. If energy prices remain near current levels, greater stability in the costs of producing non-energy goods and services will reduce pressure on core inflation over time. Of course, the prices of oil and other commodities are very difficult to predict, and they remain a source of considerable uncertainty in the inflation outlook. Increases in rents - both market rent and owner's equivalent rent - account for a substantial part of the increase in core inflation over the past year. The acceleration in rents may have resulted in part from a shift in demand toward rental housing as families found home ownership less financially attractive. Rents should begin to decelerate as the demand for owner-occupied housing stabilizes and the supply of rental units increases. However, the extent and timing of that expected slowing is not yet clear. Another significant factor influencing medium-term trends in inflation is the public's expectations of inflation. These expectations have an important bearing on whether transitory influences on prices, such as changes in energy costs, become embedded in wage and price decisions and so leave a lasting imprint on the rate of inflation. It is encouraging that inflation expectations appear to be contained. To be sure, faster growth in nominal labor compensation does not necessarily portend higher inflation. Increases in compensation may be offset by higher labor productivity or absorbed - at least for a time - by a narrowing of firms' profit margins rather than passed on to consumers in the form of higher prices. In these circumstances, gains in nominal compensation would translate into gains in real compensation as well. Underlying productivity trends appear generally favorable, despite the recent slowing in some measures, and the markup of prices over unit labor costs is high by historical standards, so such an outcome is certainly possible. Moreover, if the economy grows at a moderate pace for a time, as seems most likely, pressures on resource utilization should ease.